Brooks' marketing pitch: Step into a whole new world of cushion and stability. Upper: Mesh, heat fused and stitch-less synthetic leather overlays. Widths available: Normal (reviewed), 2E-wide in select colors. The Ravenna 6 is a 'light' support shoe, with its medial post barely noticeable in action. Very well padded with minimal bias. 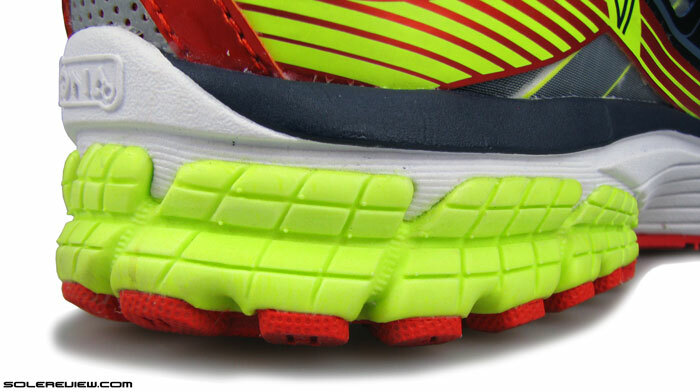 The silly toebox overlay is the only serious blemish on what would otherwise have been a good shoe. High chance of toe box overlay rubbing/catching against the big toe. 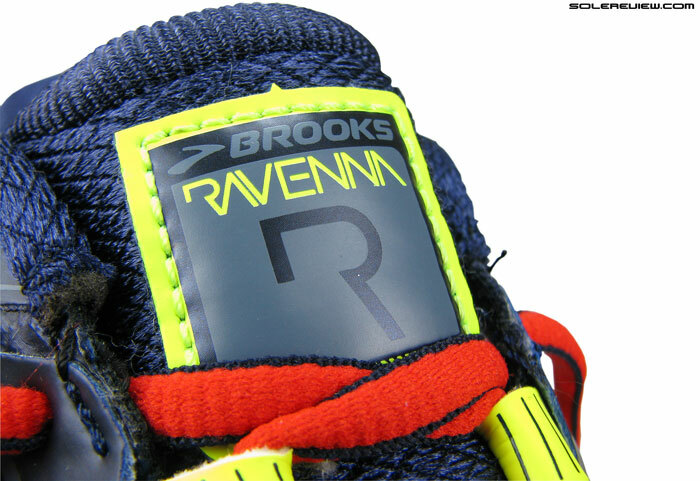 The Brooks Ravenna 6 is a ‘motion control’ or ‘support’ shoe. But what type, exactly? An impressive array of ‘motion control’ or ’stability’ running shoes adorn retail shelves, but confusingly enough, no two models feel the same. 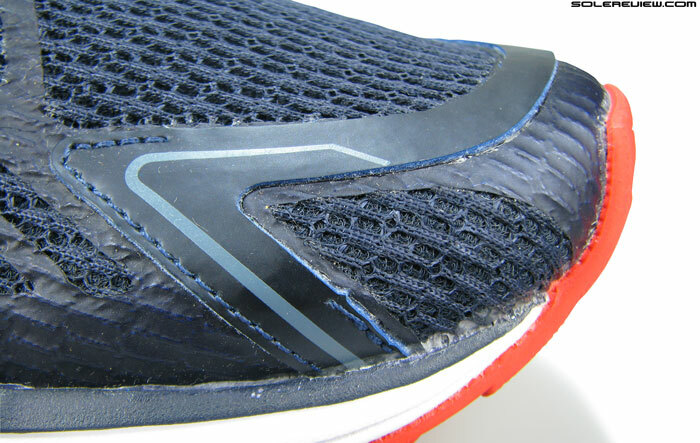 While based on the same fundamental design – midsoles using a harder medial post – a shoe’s character can depend on factors such as foam density and stacking, position/size of the medial post and other variations in design execution. So in the end, these shoes deliver a range of ride manners which can swing from firm to soft, and from overbearing medial side support to near-neutral behavior. The trick is to know which from which. Easier said than done. Functionally speaking, the Ravenna 6 is an entry level support shoe; a bridge between cushioned neutrals and serious stability models. Some runners want a shoe with the support of a harder medial midsole insert combined with soft cushioning. The Brooks Ravenna 6 sets out to make a case for itself in this category, together with other soft-support roadsters such as the New Balance 860 V5 and adidas Sequence 7 Boost. On the face of it, these models appear to belong in the same segment, but in reality only partly so. Running shoes are never as simple as that, are they? Medial post this shoe might have, yet is differentiated from other neutrally biased support shoes. Similarity with a soft motion control shoe like the New Balance 860 V5 begins and ends at the level of midsole cushioning. Separation becomes clear as the ride character starts to manifest itself, which happens to be an almost-neutral bias for the Ravenna and not so much so for the 860. Ok, now throw in the Saucony Guide 8 and Asics GT 2000 3 into the picture. Both shoes show minimal to moderate lateral (outer) midsole lean during footstrike. So from that standpoint, shouldn’t those models be comparable to the Ravenna? Again, no, because if they share something similar, they also are different in more ways than one. Our review has barely begun, and it’s already looking more twisted than a circus contortionist going about his day job in a small box. The whole point of this is: even in the generalized footwear category which is ‘motion control’, it is hard to look at shoes with a presumptive lens. The only way to get a good hang of what you’re buying is to try them on first – there is absolutely no substitute for that, not even 3,000 word shoe reviews with a wedding album’s worth of photographs. If we feel like it later, we’ll revisit how the Ravenna compares to some of other brand’s support shoes. But for now, let’s see how Ravenna fits into the Brooks play board. There are many motion control shoes in the current Brooks assortment. We’ll name a few. There’s the ultra supportive Beast 14, which is every bit as formidable as it looks and sounds. The $120 price-point is filled in with the popular Adrenaline GTS (now going on 15). And finally, placed just above the $100 bracket, lies the Ravenna. Just one wearing of the Beast ’14, and there’ll be no doubt of how that shoe is differentiated from the Adrenaline and Ravenna. But we’ll take a moment to explain the difference between the two aforementioned models, which will conversely lay bare the gist of what these shoes have to offer. The Adrenaline GTS 15 is the more supportive of the two. In other words, the midsole cushioning is much firmer than the Ravenna, and the whole motion control thing comes into play a little earlier during transitions. 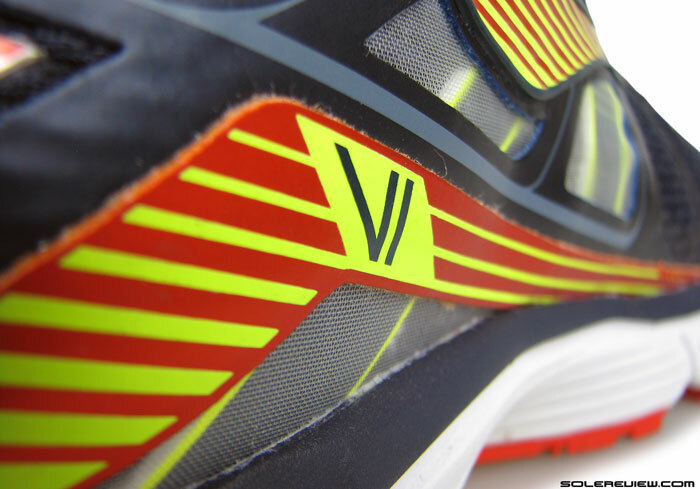 A common overlap would be how both shoes behave on the lateral side; the outwards midsole leaning is controlled, unlike shoes like the 860 V5 or Nike Structure 17 which does exactly the opposite. 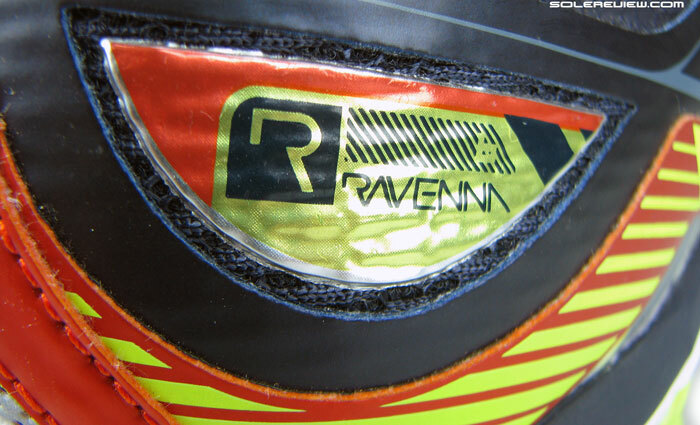 The Ravenna 6 has a soft ride despite the DRB medial post. The latter appears to change in density along its forward length, going from soft to firm. 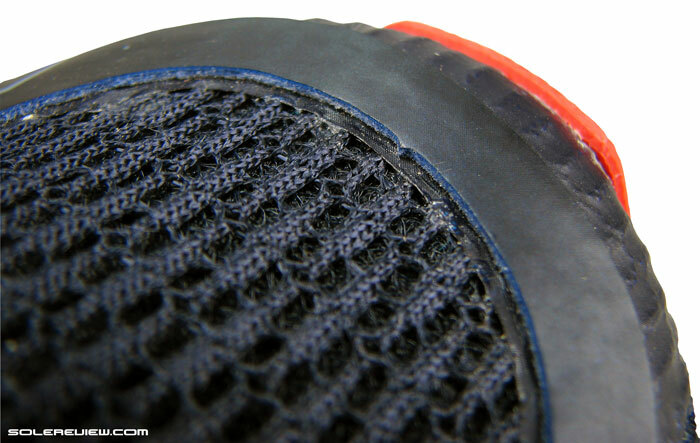 Lateral crash pads goes more than halfway across the heel, and then extends to under the midfoot. It is firmer than the main (white) midsole, so together with the medial post, it helps deliver a stable ride. The Ravenna 6’s midsole is made using triple density foam. Break it down, and that’s the medial post (hardest) on the arch side, the main Biomogo DNA midsole (softest), and the lateral crash pad in lime green (firm) which runs from heel to midfoot. Ok, make that almost-triple density, because the DRB (Diagonal Roll Bar), which is Brooks-lingo for the firm insert, actually seems to have two densities. Towards the heel the DRB insert is somewhat cushy, not very different from the white DNA foam. But as you go in further towards the midfoot, the density becomes harder, almost rock like at the point just above the plastic shank. Once the medial post ends, the soft forefoot foam begins again. The crash pad runs laterally from heel to midfoot. The two heel outsole pieces are hard rubber, with the rest of the coverage being provided by softer blown rubber. Flex grooves and siping are placed in plenty, delivering flexibility and smoother transitions. 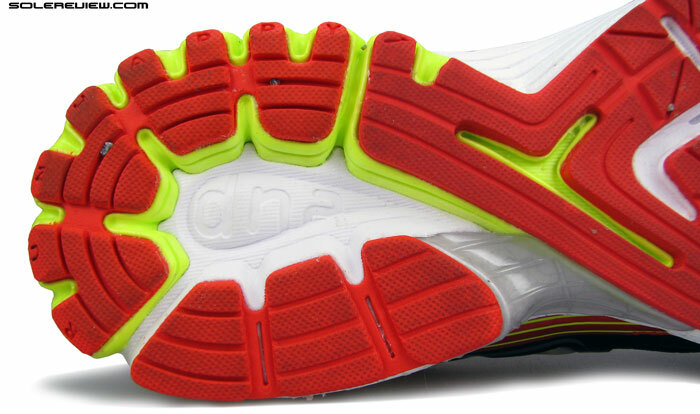 Outsole is mostly softer blown rubber compound, laid out over midfoot and the entire forefoot. Harder carbon rubber is only applied in a horse-shoe shaped formation under the heel. 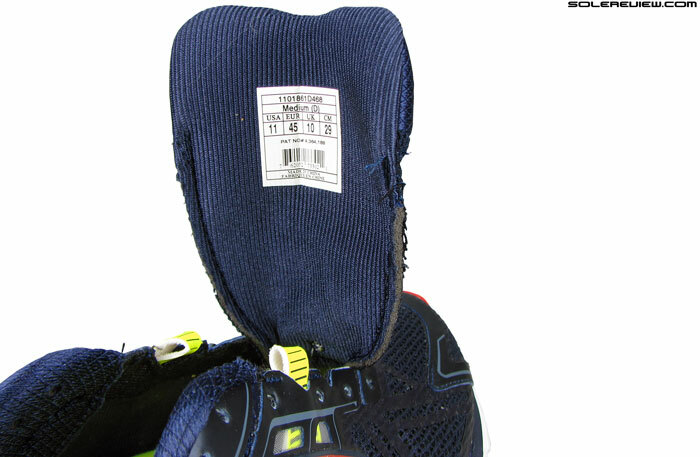 Both heel outsole halves are split by a flex groove under the medial side, which allows the lateral crash pad to behave autonomously during landings. There’re plenty of cut-outs and grooves through-out the outsole geometry, which help both flexibility and smoother transitions. Outsole rubber grips well, but as with most Brooks models, you’d wish they were tad more hard wearing. We know it’s always a catch-22 when it comes to traction vs. durability, but Brooks can certainly do better with rubber durability without making them as noisy and clunky as Mizuno outsoles. 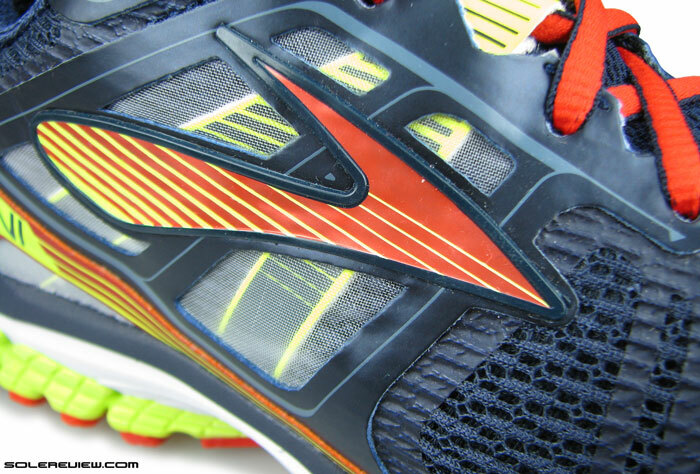 The removable insole is anatomically molded, and is a shared component you’ll see in many Brooks models. 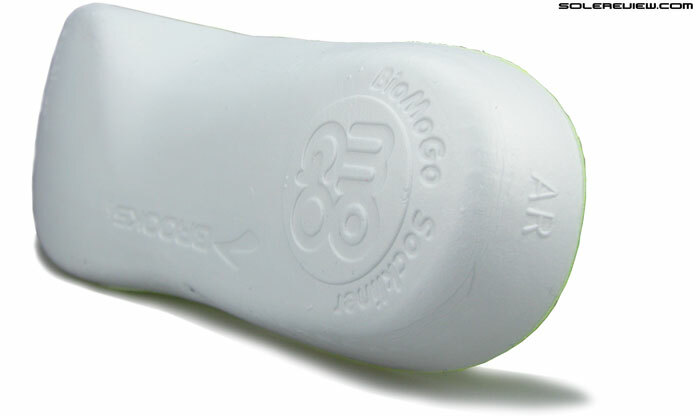 The BioMogo footbed is well cushioned, and landfill friendly too. Removable insole is molded Biomogo EVA with a soft top cloth, a type which should look and feel very, very familiar if you’ve been wearing recent Brooks models. 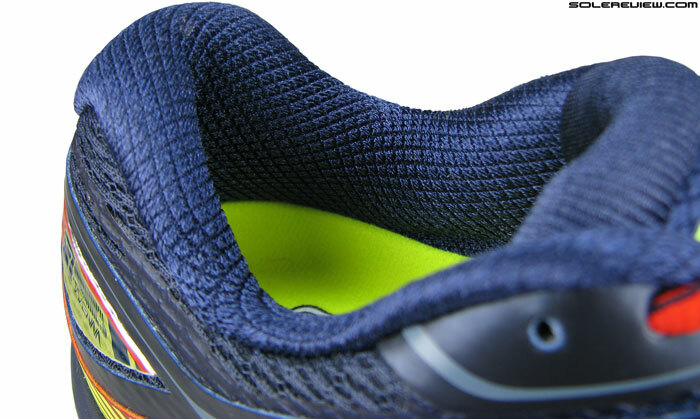 EVA foam strobel below it is a standard component which is used throughout Brooks’ footwear line. Has enough amount of squish, and works as a cushioning equalizer over the multi-density midsole. Under heel area is softly cushioned. The compression groove which runs on the lime green crash pad results in only the slightest of outwards bias. 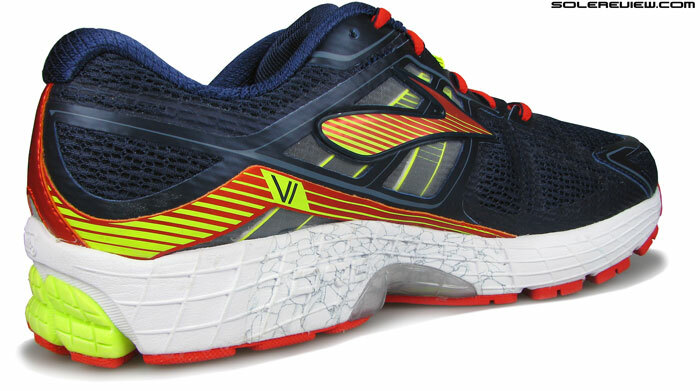 For a support shoe, the Ravenna 6 has a lot of midsole softness, almost at par with the Ghost 7 and Glycerin 12, both of which are Brooks’ cushioning cornerstones. 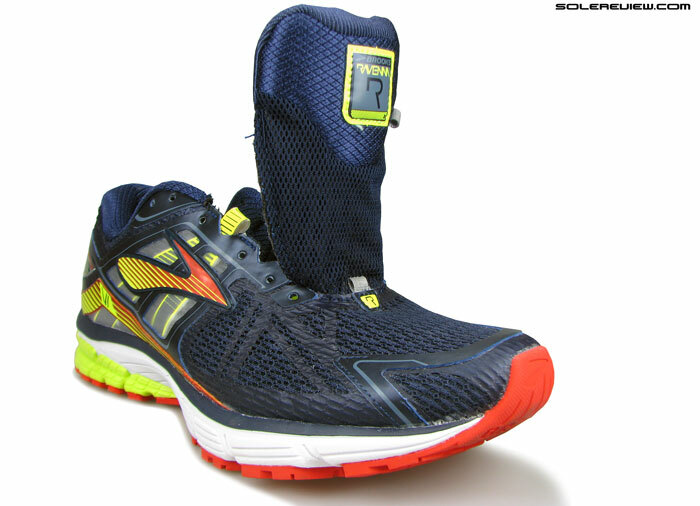 The heel is very well padded and centered in weight loading. The firmer density pads on either sides helps plant the foot, and keeps excessive outside lean at bay. 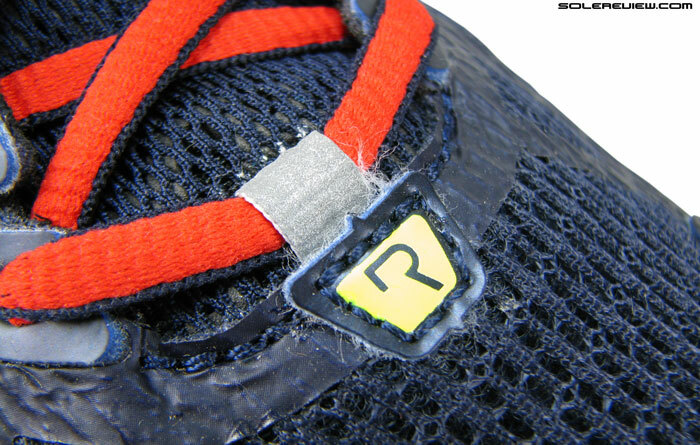 There is only a slight trace of outward heel lean, as a compression groove is set over the crash pad surface. Transitions are smooth and unbroken, as the majority of the midsole is soft, single density foam. The cushioning is not very responsive, just soft and comfortable. This transition quality produces a sense of neutral-ness in how the Brooks Ravenna 6 rides, and we can see that this aspect appealing to a larger segment of runners. The said segment will also include those seeking a neutral ride experience; the Ravenna wears both support and neutral hats quite well. It scores well on stability too, given its tendency to keep the foot centered, combined with a wide forefoot base. Prepare for our tirade against the DNA foam. Although the Biomogo DNA midsole delivers cushioning softness like most foams do, we’ve got a thing against it. Some readers might wonder why we’re constantly ranting about the Brooks’ use of DNA foam? How does it matter if it was made of Gel, foam or spaceship goo? Cushioning is what matters, correct? Not really, especially when you read Brooks’ claims with respect to how the DNA foam is supposed to perform. We would have had absolutely no issues with Brooks DNA foam if it worked as advertised. Brooks says that the BioMogo foam is non-Newtonian in nature, and so far, we’re yet to see that come to life during runs. We do pay for the shoes reviewed, so we’re paying customers first, and shoe reviewers second. If a shoe doesn’t work as intended, that’s good enough a reason to be mad about. Non-Newtonian materials (be it gel, foam or liquid) have a distinct quality – when stress or pressure is applied, they firm up. Which means, soft while walking, and firm when running. The original Brooks DNA gel had this, and in the past, we’re illustrated examples of other foam based compounds which do that. Except that none of the new Brooks DNA foam based shoes (Ghost, Glycerin and Transcend) exhibit any non-Newtonian behavior. Take the Ravenna for example. It stays soft, regardless of the speed. Even when you shorten the cadence, and do silly things like over stride and apply high intensity heel strikes, nothing changes. So all the marketing talk about ‘adapting to your running style’ is pure eyewash. The midsole is well cushioned, landfill friendly, comfortable and responsive to some extent. Brooks would have done well to just describe BioMogo as such and leave it there. Why complicate matters? The midfoot fit is extremely snug, as the Ravenna 6 uses a split strap design to secure the sides. The midfoot strap extends all the way from the upper base to the lacing area. 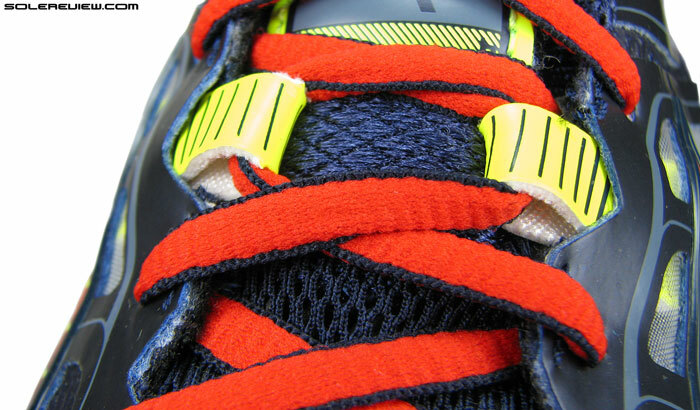 The strap forms a twin set of speed lacing loops, with its independent level of lacing pressure. 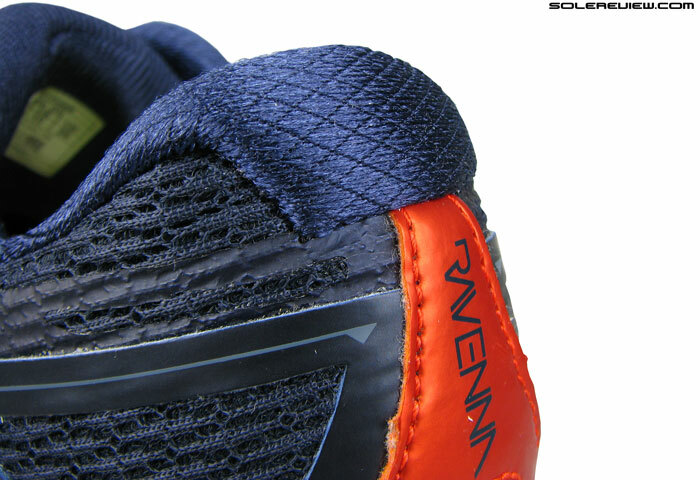 The Ravenna 6’s upper is very snug fitting, with special mention of the midfoot and heel. A split strap snakes through between the upper and lining, from the base to the lacing area. 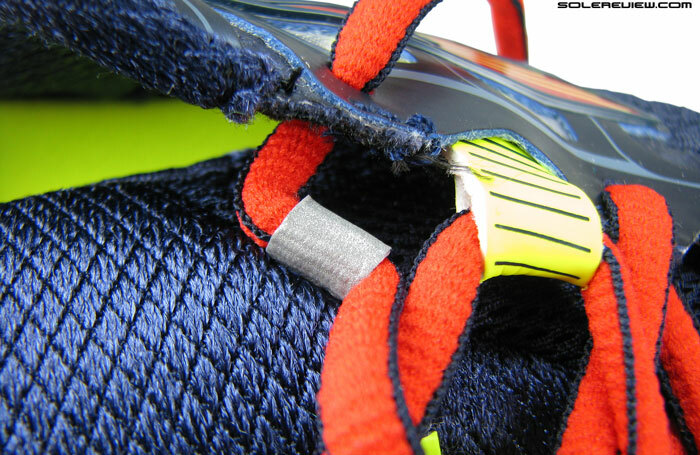 The strap converts into a row of speed lacing, and delivers a high level of wrap when laced through. It is more effective than rest of the eyelet rows, as the loops work independently, and stretches the straps taut. The padded collar feels luxe and has a snug grip, drafting off the midfoot cinch system. Brooks leaves the Achilles dip un-layered, allowing it to move together with the foot. If you use the last row of lacing, the tongue length ends up short. This has an impact on the how the collar fits, even when you don’t use the last row of lacing. Actually, if you do end up lacing all the way to the top, you’ll fall short of lacing runway which is the tongue. The latter is shorter than the Brooks Adrenaline GTS 15, so the topmost row of lacing will end up being not entirely comfortable. Sizing runs true. 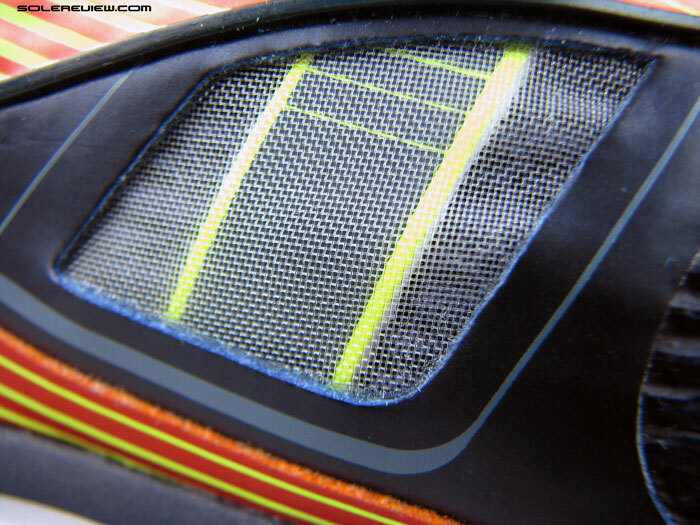 The toe box uses a thick band of overlay which tends to get in the way. Forefoot has a snug fit and heel to toe size runs true. Going for a 2E width in the Ravenna will buy you more sideways room, but then there’s that invasive toe-box overlay. 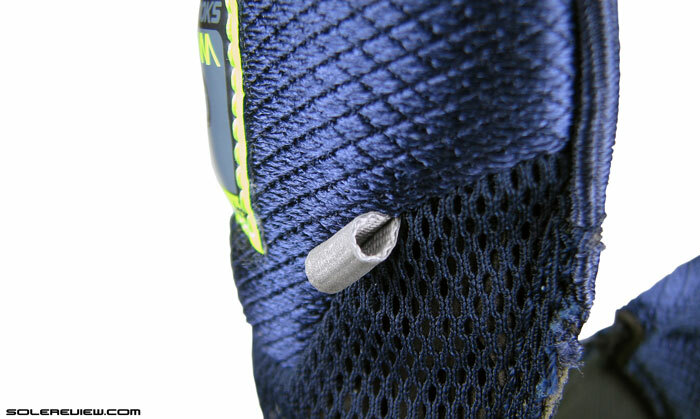 Right at the very tip of the shoe, a thick band of synthetic runs over the toe box. Although there are no seams inside the shoe, the area below the overlay forms a ridge, and tends to catch/rub against the toe. Right beneath this band is a ridge, which catches on the big toe. Chances of it being felt increases with gradient running, like going down a slope. It did bother us, and it will be potentially be felt by many others. This is more noticeable when you’re going downhill, when the foot slides forward into the toe box. So if you’re a San Francisco native for example, you’ll probably get a stronger taste of the ridge. Don’t see a solution for this except to size up, in which case your toe will stop short of the ridge with some distance to spare. That however, might come with other unwanted side-effects, so not an ideal scenario. The R-6 is a good package, except for the irritating toe ridge. Try them on before buying. This design oversight is a pity, because it mars what could otherwise have been an excellent shoe. There are a number of things to like about the Ravenna 6, apart from its smooth ride. To begin with, the choice of upper materials is well thought of, with nice touches of functional and aesthetic detail here and there. If it weren’t for the toe-box irritant, the upper feels smooth, socks or no socks. Fused hot-melt overlays made short work of inner seams. Tongue is of a non-sleeve type, but plush. Soft, foam padded tongue lining. This loop holds the tongue in place, preventing it from sliding. For example, the meshes used feel premium and with a plush hand-feel, and the upper minimizes overlays which eliminates most internal seams. The tongue isn’t sleeved in, yet there’s no slide because of an extra loop which locks in the lacing. The Ravenna 6 tongue has a sheet of thick foam sandwiched in the tongue. Yes, like the Ghost 7. …and so is the one on the forefoot. 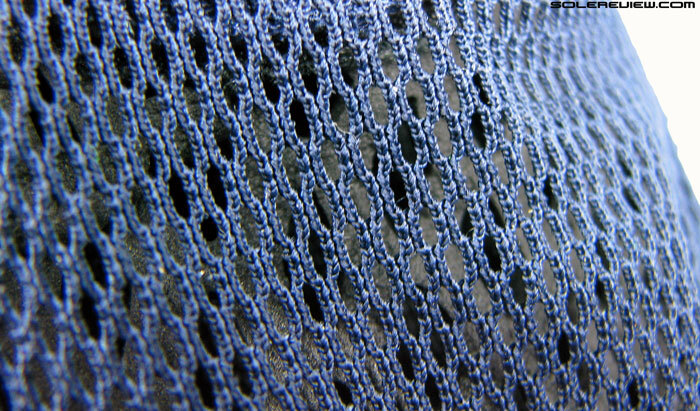 Apart from the soft lining, the tongue layers in a thick sheet of perforated foam, which absorbs potential lacing pressure. Reflectivity is also taken care of, with bits on the forefoot, tongue and heel proving effective in low light. You don’t get a sense that Brooks has skimped on the quality of materials anywhere. In fact, we see the $100 Ravenna as great value in its price segment when it comes to material execution. The Ravenna will still work perfectly well for some, but treat your purchase with caution. Buy only after you’ve had an opportunity to try these on. Go for a short treadmill burst in your local running store, and see if it passes the fit test. If it does, the Ravenna 6 will prove to be a good choice of footwear, especially when it comes to mixing up cushioning and support in well balanced doses. 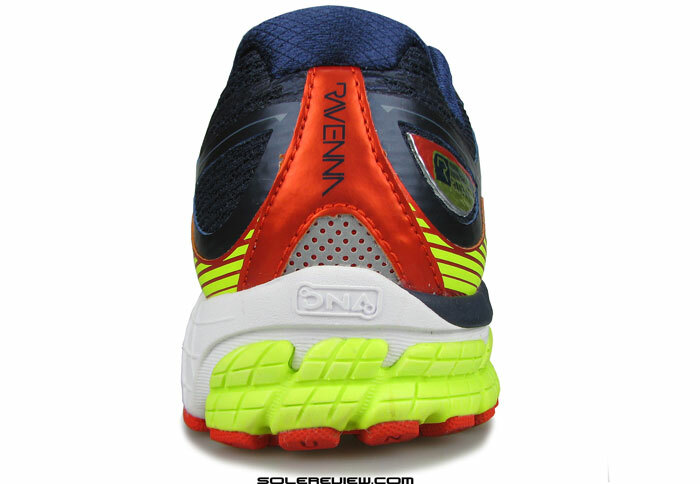 Any idea of how the cushioning in the Ravenna 6 compares to the cushioning in the Glycerin 12? I have the Glycerin 12 and I think the cushioning in it is pitiful for $150 shoe. Thanks for your input. Thanks for bringing that up. We haven’t pulled out the Glycerin 12 for a while, but from what we remember the Ravenna 6 cushioning is close, if not more softer than the G-12. Thanks. I kinda figured it was probably softer than the Glycerin. The Glycerin seems pretty good in the heel, but the forefoot seems to have very little give to it at all. I ran 10 miles the other day, about half of it in the Saucony Triumph ISO and about half in the Glycerin 12. The difference in the quality of cushioning was VERY noticeable. The Triumph blew the Glycerin away. There’s a lot of things I like about the Glycerin, just wish Brooks would fix this Super DNA thing in the Glycerin….it’s not working for me. It’s odd, because there is plenty of cushioning between you and the road in the Glycerin, it just must be that the quality of that cushioning isn’t very good. Thanks again for your reviews. I really look forward to them. Yes, between the Glycerin and Triumph, it’s a no brainer. The ISO scores. 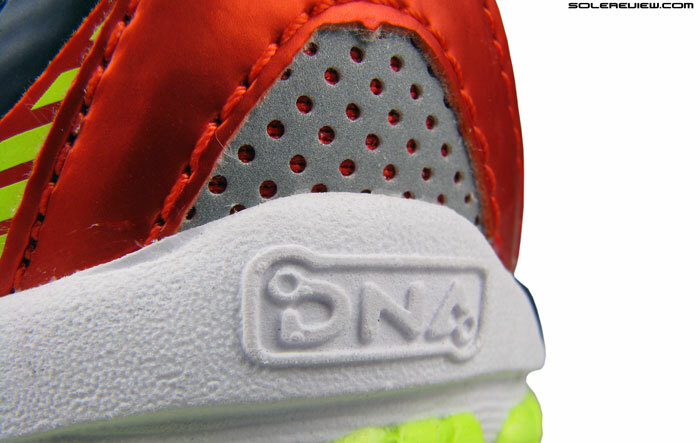 The super DNA might be a cushioned kind of foam, but that’s pretty much there is to it. Damn, killin’ it with frequent consecutive posts! Things looking good for Solereview… loving it! Thanks! You came here early – the review has been updated with a dozen more pictures and text to go. I have a bad habit of over striding and striking hard on my heal. I run 30-40km a week and have no injuries or pain to date. The heels on my shoes always wear down really quickly. I don’t pronate too badly. What shoe would you recommend to help me land more on my midfoot/forefoot. Neutral or stability? Thick or minimal sole? Footstrike correction is driven more by a conscious effort on changing form than footwear. 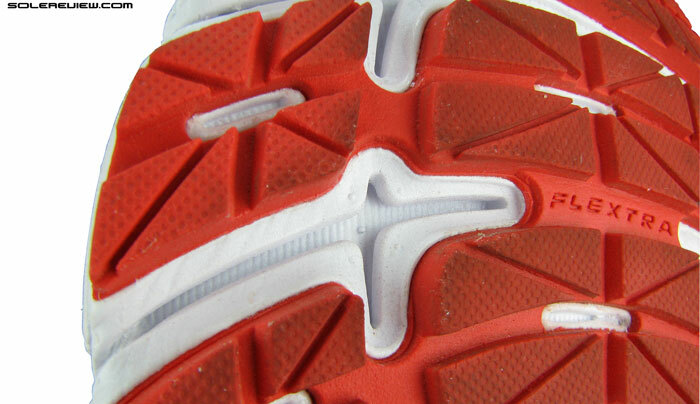 Within that context, a lower heel-to-toe drop shoe (3-6 mm) and medium midsole thickness ( >27mm) can help. There are shoes with a flared, rocker heel (like Skechers Gorun or GoRun Ride, Hoka) which helps somewhat in achieving a rear-foot strike instead of heel strike. Neutral or stability, does not matter so much as long as the shoe does not interfere (too much) with the foot movement. Kinda gave up on Brooks after Glycerin 11. Went back and stocked up on the excellent Glycerin 10. All these cost cutting DNA foam nonsense is woefully unresponsive and falsely advertised. Sadly even Saucony seems to be going the same way with their Powergrid+ (thanks for giving us Ride 7 Saucony before you start going the way of Brooks). If I just want foam I might as well move on to Hoka. Seems like Asics and Mizuno will still stick to their tried and true formula at least. We’re in agreement. The DNA does not work as advertised, and the Powergrid+ is an eyewash too. Am I correct that Brooks Adrenaline, Saucony Omni and Mizuno Wave Paradox are three shoes in the same class? I’m done with Brooks because their Adrenaline 14 was a true marvel of a shoe but their 15 model lacks a lot of the features that made the 14 so great; Saucony Omni’s dimensions somehow don’t correspond to my feet, particularly the toebox; so that leaves me with Mizuno. They somewhat belong in the same class, but ee haven’t tested the Omni and Paradox yet. So won’t be able to offer an opinion on how they compare with the GTS 14. You can also try the Mizuno Wave Inspire 11; it has a roomy forefoot. Also the Saucony Hurricane (remember to loosen the first row of lacing). Both these shoes have moderate elements of support, but come with an accommodating forefoot fit. Shame the DNA foam continues to disappoint in Ravenna. I’m 255lbs 6’4″ still have some arch with middling pronation. I’m Seattle based and want to buy Brooks. The Beast being the last Brooks shoe to be Gel based is this the better option for me over Adrenaline GTS 15 / Transcend 2? 255 Lbs? 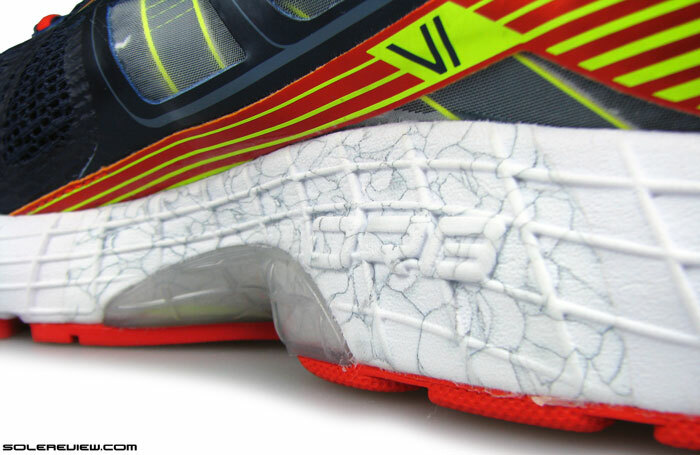 Yes, the Beast 14 for sure, has enough cushioning+stability. Just know that the upper fits very narrow, so buy 2E at the very least. 4E width is better if you need more forefoot room. Tried on every combination of Beast, 2E too wide, turns out 14D is the new 13D for me. Zappos reviews show a quite a few returns for size frustrations. Thanks for the feedback. So did you end up buying the 14D? Yes, ordered 14D Beast from Zappos–feels about 4 mil longer than Brooks Trace 12, 5 mil longer than Nike Lunar Glide 3, 13D Beast even tad tighter than Nike Shox in 13D. Appreciate the feedback, hope it works out for you! First off, you do some great shoe reviews! I’ve been reading them for hours:) ‘m a light frame female competitive runner who has used asics 2100 series ( many years ago), then the first 3 versions of saucony guide ( until they lowered the heel drop and developed Achilles tendinitis and plantar fasciitis which I’m still dealing with :() I then had the brooks ravenna 3 and 4. I was very happy with the ravenna and purchased the 6 but couldn’t even run 1 mile without incredible arch pain in both my feet. My right foot is neutral and is adaptable to most shoes while my left is very picky because I need some guidance on that foot. I was surprised that the Ravenna 6 hurt both arches so much! Very disappointed:( Any suggestions of a shoe remininiscent of the Ravenna 4? Or a cushioned forefoot, very mild medial posting, heel drop around 10-12mm that is also responsive and somewhat light weight for longer runs? We don’t have review experience with prior versions of the Ravenna, so won’t be able to offer an opinion on what contemporary shoe model will compare with Ravenna 4. Three shoes come to mind given your ask: The adidas Supernova Sequence 7, the Nike Lunarglide 6, Asics GT 2000 3. Neither of them are very lightweight, but come with normal heel drops, mild level of medial support with forefoot cushioning. The Sequence and Lunarglide are somewhat responsive, the GT just feels cushioned. Have a look at the Mizuno Inspire. I run the Revenna 5, Inspire 10 and 11. The Inspire is VERY light weight for a support shoe. I also have a right foot neutral, left foot mild+ pronation. Male ~155. I’ve had very good luck with the Revenna 5 (my cushioned trainer), Inspire my trainer and racer. The Inspire 11 has more padding than the 10 but is a little warmer (but not too much). For years I ran Asics 20xx series until landing in Mizuno and Brooks. I want to try the Revenna 6 but nervous about these reviews. Hi, thanks for all the reviews. I am fairly new to running and is in need of a new running shoe. I did a check-up with Asics Foot ID (free here in Hong Kong) and they say my feet are REALLY flat, but my running form is fairly neutral (not that much pronating). I tried the GT2000 3 on and think they are too narrow. I am looking for a new pair of running shoes to replace my current unknown brand shoes. I am about 5 feet 6, 140 pounds, runs about 30 km per week and is working towards a half marathon. As I heard from many comments, should I get a Ravenna 5 instead of 6? Or should I get another pair? I prefer lighter shoes, more flexible but has mild support for the inside of my foot. Thanks for all the great reviews! Have excluded Saucony models as the brand is not available in Hong Kong. Also did not mention the adidas Sequence 7 Boost as the fit runs narrow. Thanks for the fantastic reviews. I owned 4 pairs of Ravena 5’s and loved them then bought the 6’s. Doing lots of triathlon and iron man events I often run with out socks and these shoes removed all the skin from my toes – as pointed out in your review the new toe box seam is very invasive.I wrote to Brooks and got my money refunded. They did not reply on either occasion and I am now going through different shoe companies trying to find something simial. i am presently using saconey guide 8’s and their similar – but no where near as nice. too noisy and harsh for me. I am disapointed in Brooks. Thank you for sharing your feedback – we did think the toe box overlay to be an issue for some. What other models have you tried? 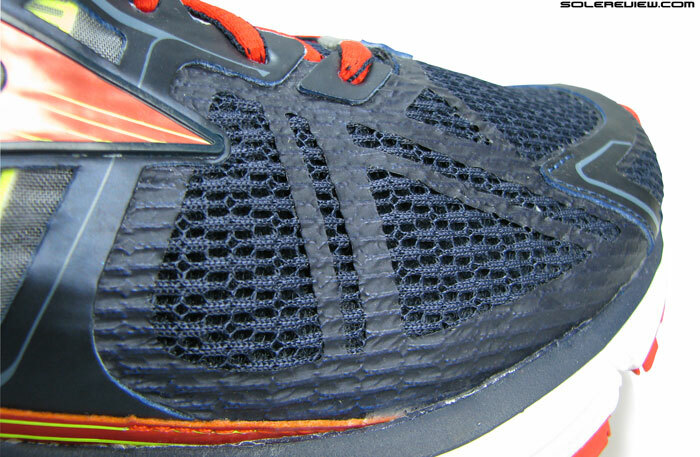 The New Balance 860 V5 is similar to the Ravenna 6, at some level. Great review! I was wondering as I’m a mid foot runner are these shoes a good choice? Yes, these should be good, no problem. Hello, I am a long diastance runner in training. I just completed my first 15k and hopefully my first half will be around the corner. I have a fairly neutral strike, but suffer from the beginning stages of bunions. Would you recommend this shoe for me? Where are the bunions exactly, and which shoe do you run in right now? And what do you like/don’t like about the shoe?